New! Bamboo Crochet Hook and Knitting Needle Box Sets! Bamboo knitting needle and crochet hook box sets have arrived! They are smooth and lovely and they come in a beautiful bamboo box to keep them neat and organized. If you are one of the lucky folks who received one of our gift certificates this might be what you need to treat yourself with! 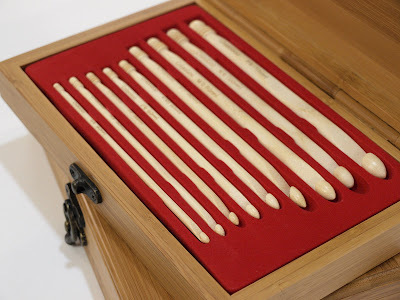 The bamboo crochet box includes 9 bamboo hooks in sizes from 4mm (G) to 11.5mm (P). 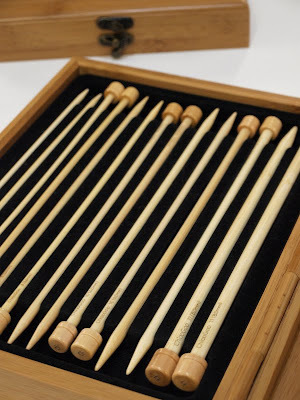 The bamboo knitting needle box includes 7 pairs of 9" straight needles, sizes US 6-11 (4-8mm). Much love from all of us at Fancy Tiger Crafts! Holiday Project: Felted Acorn & Fabric Giftwrap! 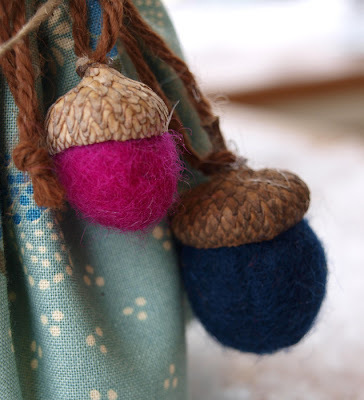 These little felted acorn ornaments are a great way to adorn your holiday gifts! We wrapped our gifts in darling Hope Valley prints by Denyse Schmidt, but this project is a fabulous way to use up fabric scraps from sewing projects past. 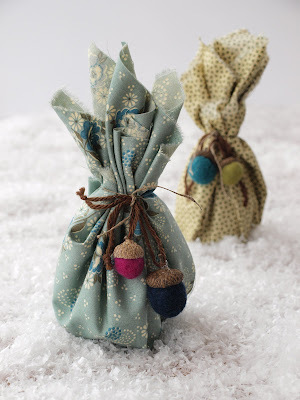 The eco-friendly wrapping is re-usable and oh so easy! It doesn't even matter what's inside because your gift will be the most adorable and coveted item under the tree. Take a pinch of wool roving about 3" long (we have over 120 colors here at the shop to choose from). Roll the roving in your hands first and then dip the loose, woolly ball into a bowl of hot, soapy water (we just use dish soap). Now roll the wet ball over and over in your hands until it is nice and felted (this may take a few minutes so be patient.) You can alternate dipping your ball into cold water and the hot soapy water to speed up the felting process. Once your ball looks nice, rinse it in cold water and set onto a towel to dry. When your felted ball is dry, simply hot glue a real acorn top to it. You can collect all different types of acorn tops for different sized balls. We tied a piece of yarn around the top of the acorn to hang. This project is great for kids ages 3 and up. No time to felt? We also sell felted wool balls already made up in our spinning and felting room! 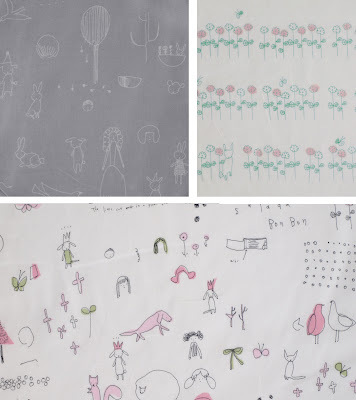 We are in love with Megumi Sakakibara's fabrics! 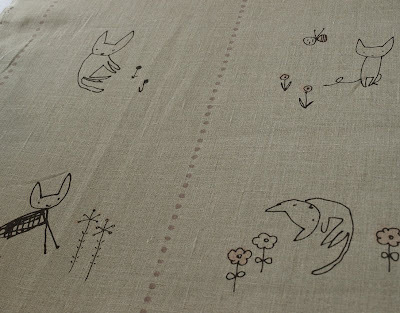 Simple line drawings of adorable creatures of all kinds are printed in soft hues on linens and cottons. 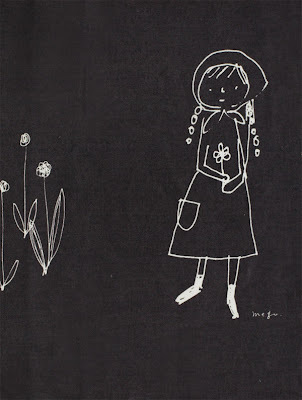 This adorable little girl is printed on a very large scale, measuring 11.5" from head to toe. 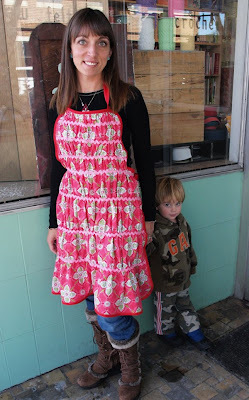 Jessica came into the store with the most adorable apron--and totally amazed us with the fact that she created her own pattern from a vintage apron. Nice work, Jessica! I am a stay at home mom to my 3 little muses. I craft because I like to make things that are cute for my kids. I like to make things just to see if I can do it--mostly embroidery, needlefelting, quiet books and knitting. Tell us about your apron. 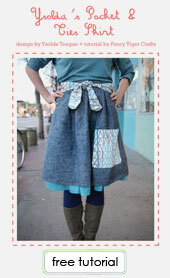 My friend Heather and I were looking for cute aprons that didn't cost a fortune. She found one in an antique store that we completely tore apart to use for our pattern. We used material from Fancy Tiger and scrap bias tape and ric-rac from home. I began crafting after I had kids. When they were first born I was so bored, I just needed something to do. I just started doing stuff. A dragonfly, but that is more of an insect, I guess. Our favorite modern quilter, Denyse Schmidt, has a new collection of fabrics out! We are in love with the palette and the adorable vintage-meets-modern prints. They will inspire you to make not only quilts--we see retro blouses, patchwork pillows and simple cloth napkins. Click on the above image to see the fabrics! Crafty Gift Guide: Stocking Stuffers! Welcome to the crafty gift guide, part 3--here are some stocking stuffer ideas for the crafty folks in your life! Brand new in the store and exclusive to Fancy Tiger (because we make it right here!) 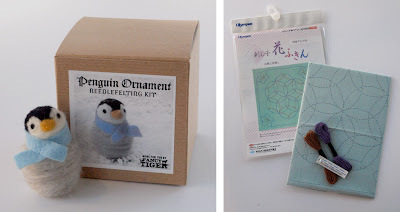 is our Penguin Ornament Needlefelting Kit. Our needlefelting kits have everything you need to learn the craft of needlefelting and are a great way to keep kids and adults busy on Christmas morning. Sashiko kits are a great way to learn the traditional Japanese sashiko embroidery known for it's simple and pretty geometric stitching. Make a pillow or an elegant table linen. We are in love with handcrafted wooden buttons! We have them in all shapes and sizes. What a cute addition to a sewing or knitting project! Sewers and embroiderers will love a colorful and functional Jelly thimble for protecting their nimble fingers. Pair them with super sharp Gingher thread snips, the epitome of German craftsmanship. French General Layer Cakes and Charm Packs are pre-cut and ready for a patchwork project. They include 42 different prints--an entire collection--so each fabric piece is different. A great gift for sewers or quilters. We love Handmade Nation. This documentary takes a look at the amazing craft movement and features some amazing and inspiring handcrafters. This DVD is the perfect gift for any modern crafter! For the fiber enthusiast, Wild Fibers magazine will take you around the world on a journey of fiber fun. Spinners, weavers, felters, knitters and crocheters can learn all about different fiber animals, cottage industry production, and more! Your stockings will be stuffed to the cuffs with inspiring and functional crafty-ness. Crafty Gift Guide: For the Craft Sewer! Welcome to the crafty gift guide, part 2--here are some great gift ideas for the special seamsters in your life! Some new and irresistible sewing books are on the shelves! One Yard Wonders is a great book full of projects small enough to make with just a yard of fabric. 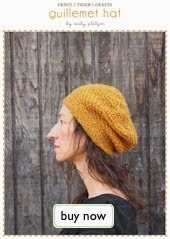 With projects that are simple and quick, it's a great book for even beginner sewers. You've recently heard me gush here about Ruth Singer's The Sewing Bible. It is an amazing sewing reference book. We've been anxiously awaiting the new Sew Liberated book and it is finally here! This book has some super adorable projects in it that we can't wait to make. Gingher Tailor Shears are truly a sewers best friend. Hand crafted from high carbon steel, cutting fabric with them is like a dream come true. We have tons of cute notions and supplies that are perfect stocking stuffers, like the classic tomato pincushion, fat quarter bundles in cute prints, pattern weights, mini sewing card patterns and lots more fun little things! French General's Sewing Tote is ready for keeping sewing projects neat and organized. Inside you'll find little screenprinted pockets for your scissors, sewing thread and bits and bobs. Sewing patterns galore! We have independent sewing patterns for everyone--patterns for garments, bags, kids, and home by your favorite designers like Amy Butler, Sew Liberated, Anna Maria Horner, Colette, Heather Bailey, Echino, Melly & Me, Portobellopixie, Oliver & S, Grand Revival, Valori Wells, Mod Kid and more! Crafty Gift Guide: For the Crafty Knitter! 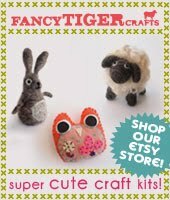 Welcome to the Fancy Tiger Crafts Holiday Gift Guide! It's time to get a little something special for the crafty folks in your life, so all week we will feature some of our favorite things--some of the coveted craft supplies in the store that we dream about every day. 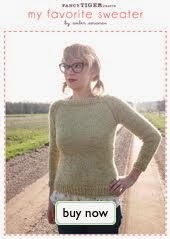 Today is all about the knitters! 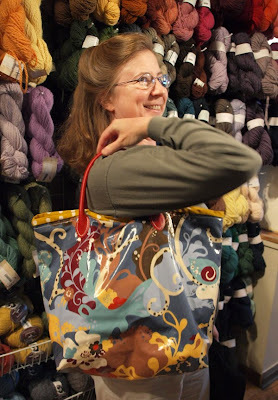 Fancy Tiger Project Bags are great for the knitter on the go. Made from some of the cute fabrics that we carry on the sewing side of the store, they are ready to keep a work in progress tidy and portable. Clip it to a belt loop and a very coordinated knitter can even work on their project while on their morning walk. Just make sure to look both ways before crossing the street. Fancy Tiger Wool Wash is made in small batches right here in Denver by our favorite herbalist, Tonja Reichley of Moondance Botanicals. Our wool wash is made with all natural ingredients and essential oils and is gentle enough for the most delicate handknits. Fancy Blend is sweet and floral, with essential oils of lavender, sweet orange and tea tree. Tiger Blend is spicy and citrusy, with essential oils of coriander, ylang ylang, amyris and lemon. 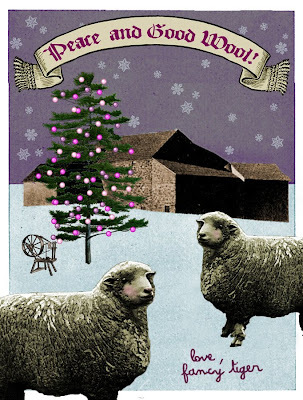 Letterpress gift tags with sheep and yarn are an adorable addition to your gift! The Addi Clicks interchangeable needle set is perhaps the knitter's most wanted item in the store. Smooth and reliable joins, flexible cords and the classic sleek Addi Turbo needles make this the hottest interchangeable set around. Made exclusively for Fancy Tiger Crafts, these hand forged copper penannulars are made from reclaimed copper wire. It makes a simple and beautiful pin for a hand knit shawl. The penannular, also known as a cloak pin or kilt pin, is one of history's oldest fastening devices! Wagtail Mohair is one of our most special yarns. The mohair comes from a single herd of angora goats on a family-run farm in Queensland, Australia. The mohair is sheared, washed, dyed, and spun into the most lustrous yarn we've ever seen by Kevin, Betty and Gaylene. Check back soon for more gift ideas! Holiday Handmade this Friday and Saturday!! Fancy Tiger is pleased present the 2nd Holiday Handmade alternative craft fair this weekend! 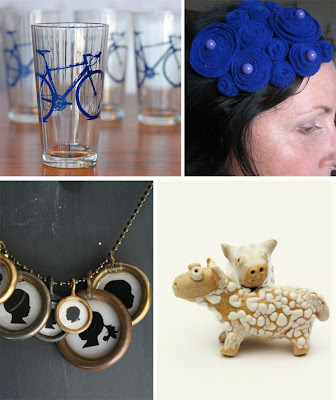 Holiday Handmade will feature 60 local crafters selling their wares. The perfect venue to support local crafters and buy handmade, you'll find everything from needlefelted ornaments, handbound journals, organic cat toys, handmade soaps, re-purposed skateboard jewelry, handspun yarn, felted scarves, and ceramics to name just a few of the amazing handmade products that will be offered. Check out our website for a full list of vendors. Holiday Handmade is located just one block east of Fancy Tiger Crafts at the South Broadway Church on the NW corner of Lincoln and Ellsworth. 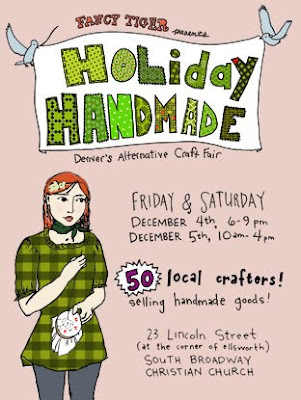 The Denver Handmade Alliance is partnering with Fancy Tiger for this years Holiday Handmade. The first 50 lucky people through the door both Friday, December 4th and Saturday, December 5th will receive a tote bag full of goodies from local designers brought to you by the Denver Handmade Alliance! Katrina visited us recently from Virginia. She came to our Sewing Help Night and made this adorable tote bag. Nice work Katrina, come back and visit anytime! I'm a project/program manager and I've always enjoyed working with my hands. Knitting, crochet, baking, cake-decorating, cross-stitch, polymer clay, sewing and photography. Tell us about your tote bag. It's a simple tote made from fabric and Japanese bag handles from Fancy Tiger. I used a $1 pattern from Joann's. I looked at quite a few and then winged it with the fabric I bought. I used heavy thread for sewing through the laminated fabric in fun colors. I came to the Wednesday night Sewing Help Night to use the sewing machines as I am traveling. 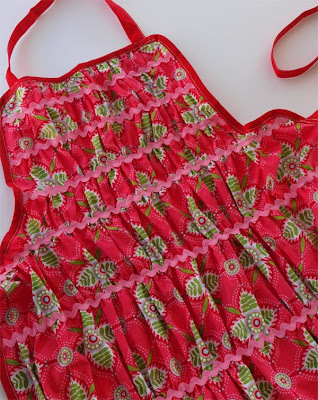 When I was a little girl, my father's mom sewed--actually both of my grandmothers did. They made whatever they needed. My father's mom used to make us bookbags and silky pillowcases.